At the last club meeting we discussed the likelihood of the club regaining access to the Baring Head flying site. To my knowledge it has been a very long time since anyone flew hang gliders there, in fact so long ago I’m not even sure paragliders committed aviation then. My log book entries for flights at this site are a bit patchy however I have six entries the first one dated 20/2/1977 (makes me feel very old). Because Baring Head is a low flying area, we always used to phone up Wellington Aero Club and advise our intentions to fly. (No such thing as a mobile phone then!) In those days the trip was a mission in itself. The road from Wainuiomata to the coast was unsealed; dusty; full of corrugations and enormous holes. I recall long bone shaking trips to the site. Access to Baring Head take-off was through a gate a couple of kilometers back from the beach. The gate is a short distance from a bridge crossing the Wainuiomata river and the track double backs up over a ridge and then heads south to the light house. After contacting the Aero Club we would race over with great expectations trying to beat the Old Man Southerly; well known to hit Wellington region with a vengeance and then gradually die away. Time the southerly right and there is some great soaring, but in the dying southerly, staying up is often a challenge. Baring Head held extra incentive to stay up and land back on top, as there was no easy vehicle access to the beach. Landing below meant a long haul on foot back up a goat track to the top. I confess to trekking up the hill most times I flew there. When I first started flying in 1976, the weather was uncooperative as ever. I attained novice/intermediate rating doing lots of bunny hops at Macalister Park and Titahi Bay, but never having had more than sled ride flights at Paekakariki. 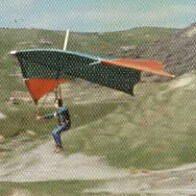 The winds just never prevailed for Paekak hill and my first extended soaring flight was at Baring Head on 27/3/1977 (In the glider pictured). I still remember the exhilaration, hovering and turning 50 to 100 feet above and around the Baring head lighthouse seated with my feet dangling below. I actually top landed after 20mins and had a second flight of 12mins before the wind dropped. The site was rated Novice and it had an easy soaring take off. The cliff line is undulating and eroded, but there were reasonable paddocks to land on behind takeoff with smooth rotor free landings. The glider pictured was nick named the “Mini Brick” (for good reason) and I believe gliders of today’s performance would achieve vastly better height above the ridge and the site may offer a bit more opportunity and challenge. Perhaps it will be possible to get enough height to Jump the sizable gap in the ridge and fly over to higher hills east of takeoff. My last flight at Baring head was 13/3/83 in a Pacific Kites Vampire. It was a sled ride due to the wind being too far to the east. I can’t recall exactly when we lost access to the site but I think we found Canon Point and Mt Climie as an alternative. However, I think the road is a more pleasant drive now and will be much closer for Wellington pilots.